Summer in Queen Anne’s County is full of lots of wonderful traditions—crabs, beaches, boats… and the Library’s Summer Reading Program! This year, nearly 2000 children participated in this program at both Kent Island and Centreville Libraries, with an additional almost 800 adults joining in. The Friends of Queen Anne’s County Library—a non-profit membership group dedicated to supporting the county library—provided all the funding to make the youth program happen in 2018. At its core, the program is designed to encourage kids to keep reading during the summer months when they are out of school, but the summer program in Queen Anne’s County has grown to provide students with a wide range of opportunities to participate in science experiments, art classes, book clubs, and more. In addition, the staff has worked to develop a parallel program to encourage adults to not only read in the summer but to explore new authors, topics, and worlds in the book selections. To celebrate this year’s program theme of “Libraries Rock,” the Friends of the Library worked with locally based PRS Guitars to provide a special incentive to library users this summer—a brand-new PRS Guitar (valued at more than $650). All Summer Reading Program participants over the age of 5 were eligible to enter to win the guitar and encouraged to enter the raffle for the guitar each time they visited either Library. 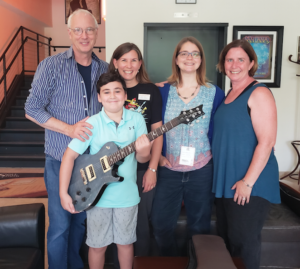 Ten year-old Stevensville resident Zander Smith was the lucky winner from more than 1500 entrants and was presented the guitar by PRS Guitars Founder and Managing General Partner Paul Reed Smith at PRS headquarters on Kent Island. The first 900 children who registered received free Libraries Rock t-shirts, and those who visited the Library during July and showed staff that they had been reading received coupons entitling them to a free kids’ meal, compliments of the local Hardee’s restaurant. Teen readers were active in the program, with participants entering raffles to win Amazon gift cards each time they read two books. This year’s teen grand prize was a Fujifilm Instax camera and film. “We’ve seen a higher level of engagement than ever before with over 400 children already returning their completed reading calendars and choosing a free prize book to keep,” said Queen Anne’s County Library youth service coordinator Julie Ranelli. Children and teens will continue to report completions and choose prize books throughout August. The Friends of the Library worked hard to support summer reading this year, providing funding for t-shirts, guest speakers and programs, and incentives for participants of all ages. In addition to PRS Guitars and Hardee’s, Soistman Family Dentistry, 721 on Main, Christ Episcopal Church Day School, Brazilian United Soccer Association (BUSA), Aqua Swimming and Training, and Bellies, Babies, & Beyond all provided support to the Friends to ensure the program success, as did the more than 300 local community members who are currently members of the Friends of the Library.